When I first journeyed to Tibet in the late 1990s, I was on a pilgrimage in the foot?steps of a nineteenth-century Tibetan mystic named Tert?n Sogyal. 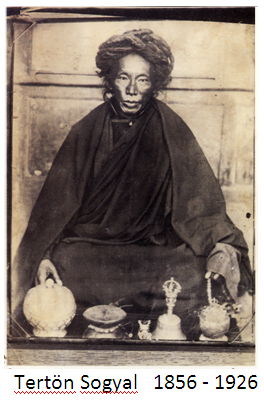 A horse-riding bandit turned meditation master, Tert?n Sogyal eventually became the teacher of the XIII Dalai Lama, the predecessor to the current Dalai Lama. Such was the prevailing belief that Tert?n Sogyal?s mantras and prayers could protect Tibet from foreign armies that the Dalai Lama sum?moned him to Lhasa to serve the nation. Tert?n Sogyal essentially became Tibet?s Tantric Defense Minister. Not unlike the Dalai Lama today, Tert?n Sogyal was a master at integrating his political duties with spiritual practice, while the never losing the pure motivation that holds others? well-being as the priority. I first learned of Tert?n Sogyal in 1996 when I met his reincarnation, Sogyal Rinpoche. I was in graduate school in London studying Indian phi?losophy. I was drawn to Tert?n Sogyal?s life story because I know politics matter. My parents had instilled in me an awareness that social action is not so much a choice as a responsibility?to ourselves and to our community. There was something in Tert?n Sogyal?the way that he pursued the path of spiritual enlightenment even while in the unsavory theater of politics?that I wanted to understand more deeply. The two years before coming to London I had lived in extreme contrasts?on the one hand meditating in Nepal and on the other involving myself in partisan environmental politics in the Rocky Mountain states of America. In Nepal, I had spent months meditating under the guidance of a Tibetan lama in the foothills outside Kathmandu. I was introduced to methods of meditation and yoga that are meant to uncover the indwelling potential of spiritual awaken?ing that each and every one of us possesses. After six months of medita?tion retreats, I returned to Wyoming and began working in environmental politics, battling oil and gas lobbyists in legislative hearings in Cheyenne. I continued to practice meditation in Wyoming, but it did not take long before the meditative serenity that I had experienced in Nepal was but a memory. In the face of my political adversaries, a vindictive mind would arise with ferocity. The divide between my social activism and spiritual practice was vast because I didn?t know how to take the insights and peace I experienced on the medita?tion cushion into the world. When I arrived in London for graduate school and began studying meditation with Sogyal Rinpoche, as well as the history and the works of the mystic Tert?n Sogyal, I realized that here was an example of what I aspired toward. Tert?n Sogyal possessed an endless reservoir of wisdom and strength to draw from while working in the volatile political realm of late nineteenth-century Tibet. This reservoir was something that I needed to tap into. So after I graduated, I decided to see where Tert?n Sogyal?s saintly life had played out?and deepen my own meditation practice?in hallowed caves and hermitages high on the roof of the world and among Tibet?s sacred temples and shrines. I set up a base in Kathmandu as a free?lance journalist to fund my travels and began making frequent trips to Tibet. The road map for my pilgrimage was Tert?n Sogyal?s own far-ranging travels across the plateau; his life was not bound to isolated mountain re?treats. Soon I was meditating among hermits in remote sanctuaries and cliffside grottoes. I slept in the caves where Tert?n Sogyal had experienced spiritual visions and revelations. On foot, horseback, and dilapidated buses, I crossed the same glacier-covered passes that he used to travel from eastern Tibet to Lhasa. And I sought out the masters and yogis still alive who uphold Tert?n Sogyal?s spiritual lineage and could tell me the oral history of his life and teachings. But the pilgrimage took an unexpected turn. The more time I spent in Tibet delving into the nineteenth-century spir?itual teachings of Tert?n Sogyal, the more often I met Tibetans who wanted to tell me their story of frustration and pain, and about their never-ending hope that one day the exiled Dalai Lama would return to Tibet. 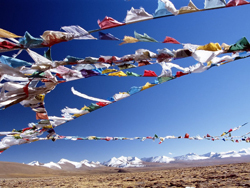 Traveling as a Buddhist pilgrim, I gained Tibetans? trust. Political prisoners who had experienced abuse and torture in Chinese prisons showed me scars. Monks and nuns who had been kicked out of their monastery gave me their expul?sion notices from the local security bureau. I was taken to meet a Buddhist leader who had been scalded with boiling water and then jailed for five years for publicly praying to the Dalai Lama. Tibetans not only told me their stories, but early into my pilgrimage they asked me to spirit such firsthand accounts of human rights abuses out of Tibet and into the hands of Western governments and advocacy groups. While I still wanted to search out Tert?n Sogyal?s meditation techniques, I became a courier of often graphic accounts of torture and abuse. This re?quired evading China?s vast security network of plain clothed security agents, undercover cops in monk?s robes, and the sophisticated cyber police. And, during my more than fifteen trips to Tibet over the course of a decade, I photographed Chinese secret prisons where Tibetan monks and nuns are incarcerated for their Buddhist beliefs. 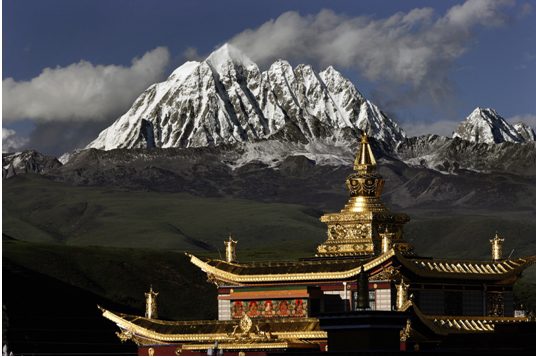 The journey in Tert?n Sogyal?s footsteps became a different kind of pilgrimage. While I do not claim to have benefited anyone from my human rights work, I can say that I have tried to apply what my teachers have taught me about acting for the benefit of others. I have given voice to what I have witnessed. I know in politics, ultimately, there are no winners, for every politician will die and every government will eventually fall?the wise, durable question is not if a political system will survive, but when will it fail? Because everything is impermanent, including politicians and their governments, we have a responsibility to affect change that will bring about the conditions RIGHT NOW for others to find contentment and happiness. This is why I, and many others like me who have been so profoundly affected by Tibet’s unique wisdom culture, cannot let the world forget about Tibet. Chinese leaders want the governments and the people around the world to forget about Tibet, to turn their backs on monks, nuns, musicians and bloggers who languish in prison for their religious beliefs and their peaceful expression of political views. It is the responsibility of those of us who have the freedom to travel, to write and express our opinions, to talk to our own and others’ governments, to not only bear witness but to act to change injustice. This is why I documented China’s human rights abuses in Tibet and why I wrote In the Shadow of the Buddha. I do not expect everyone to take up the Tibet issue. That is not my intention for why I write. But wherever we find ourselves in the world, I hope my writings encourage readers never to lose hope and faith and a sense of responsibility to those who are suffering in their family, in their community, or in other countries.